Siphone Vorasan (second from left) invested in looms and now employs several women. Photo: Xaykhame Manilasith/ADB. As a housewife, Siphone Vorasan—a 56-year-old resident of Phonsoung village near the capital city of Vientiane—spent much of her day hauling firewood for cooking and boiling water in her home. When she wasn’t making the grueling daily trips into the forest, she was busy doing household chores. She worked long hours, yet made no income. The people in her village are well-known for making beautiful, intricately embroidered cloth that sells for a good price in the capital. Siphone had the skill passed on to her by her mother, but she could afford neither the loom nor the expensive silk she would need to get started. In 2007, her situation began to change. She joined a village development revolving fund, a community organization that provides loans to help women start small businesses as weavers. With a loan of about $180, she bought a loom and some silk. She worked in her spare time between household chores and soon paid off the loan. She then started acting as a go-between, bringing the woven products of her neighbors to market in Vientiane. This increased her income to the point where she was able to invest in helping other women obtain their own materials and get started. The $180 loan Siphone took out in 2007 has helped her business grow and allowed her to buy a nearby rice field to earn even more income. She was also able to improve her house and send her five children to school. She has invested in 15 looms for other women who now are earning on their own. Siphone and her neighbors were assisted by the Nam Ngum River Basin Development Sector Project, a partnership between ADB and the Lao People’s Democratic Republic that was designed to reduce poverty, particularly among women and poor ethnic groups, while promoting economic growth and integrated water resources management. The $24 million project encourages people living in and around the river basin to engage in economic activities that do not damage the surrounding ecosystem. In Phonsoung village in Vientiane Province, where Siphone lives, women initially received a loan of KN1 million (about $120) to get started. If the loans were promptly paid back, borrowers could secure higher credit lines of up to KN5 million later, according to Khamphai Phanthavong, head of the Agriculture and Forestry Department in Hinherb district, where the village is located. 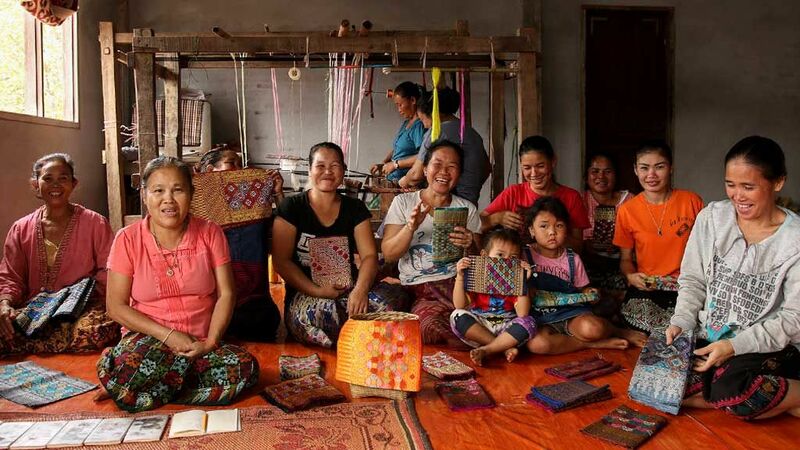 As part of the project, borrowers formed 10-member groups who support each other in obtaining looms and silk, getting their weaving businesses started, turning a profit, and repaying the loan. Most of the women make intricately embroidered sashes based on their own designs, and try to be as creative as possible to fetch the best price. The people in Phonsoung village were among nearly 40,000 households who received microfinance loans aimed at creating income-generating opportunities, such as weaving and livestock raising. Families in more than half the villages benefiting from the project reported increased incomes, decreased poverty, and higher agricultural productivity. Women and ethnic groups in particular, benefited from the project. An estimated 85% of new borrowers in the project were women. There was a high level of participation by members of the Hmong, Khmu, and Lao Tai ethnic groups in the community projects. The project helped extremely poor slash-and burn farmers like Nai Jon to shift to raising and selling cattle. 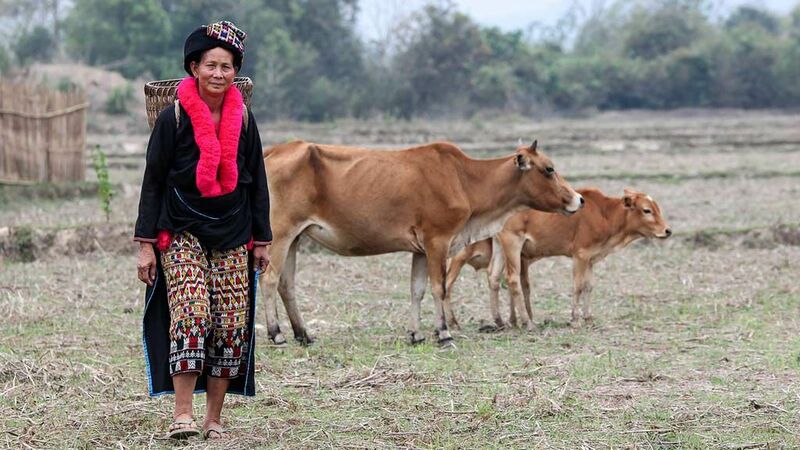 For Nai Jon, a 58-year-old resident of Naxay village, near Vientiane, the importance of the project came down to just a few cows. Her family of four girls and four boys, including one son with heart disease, used to endure a daily struggle for survival that kept them out of school and denied them medical care and other basic needs. Nai Jon and her children, all members of the Hmong ethnic group, were slash-and-burn subsistence farmers who were constantly on the move seeking fertile soil to grow crops. It is a dangerous form of farming that damages the environment and endangers the health of the impoverished farmers who have to resort to it. In 2006, ADB conducted a study to find the best way to help people like Nai Jon make a decent income and not damage the forest. The study found that cows, which are valued both for milk and for meat, and do not require extensive training to raise, would be the best way to help extremely poor slash-and burn farmers and others struggling on a subsistence income. Each family received two cows as an initial asset—a male and a female—along with training on how to care for them. To pay for the cattle, the families were each required to give back four calves, which were then distributed to other families. In the beginning, 10 families in the village had 20 cows. Now, 40 families have 184 cows. Nai Jon’s family was one of the recipients 11 years ago. Since then, their lives have revolved around raising and selling cattle near their home. She has been able to improve her house and send her children to school. This article was originally published in Together We Deliver, a publication highlighting successful ADB projects across Asia and the Pacific that demonstrated development impacts, best practice, and innovation.